In the third trimester of her pregnancy, Baltimore private investigator Tess Monaghan is under doctor's orders to remain immobile. Bored and restless, reduced to watching the world go by outside her window, she takes small comfort in the mundane events she observes . . . like the young woman in a green raincoat who walks her dog at the same time every day. Then one day the dog is running free and its owner is nowhere to be seen. Certain that something is terribly wrong, and incapable of leaving well enough alone, Tess is determined to get to the bottom of the dog walker's abrupt disappearance, even if she must do so from her own bedroom. But her inquisitiveness is about to fling open a dangerous Pandora's box of past crimes and troubling deaths . . . and she's not only putting her own life in jeopardy but also her unborn child's. Well of course it's perfection for the title! Plus I just love the color of the raincoat in the first place. Oh Tess. So bored, this isn't going to end well! If you've seen Hitchcock's "Rear Window" and appreciated his stunning work, you'll love The Girl in the Green Raincoat. Similar to the movie, this book deals with a woman who must be content spending her time watching other people through a window. Tess watches the mundane events that occurs outside, until one day something changes. When she thinks that something is amiss, she does everything in her power to solve the mystery from behind closed doors. Little does she know what she is in store for! At a little under 200 pages, I was a little concerned when this book first arrived. I was wondering how Laura Lippman could fit an intriguing mystery in such a small amount of pages. Let's just say, I shouldn't have worried! It is a quick read for sure, but in the best way possible. The pages just flew by as I devoured Tess' character, her worries, her investigation, and everything else that was wrapped up in this wonderfully written mystery. The prose in this story is also fantastically witty. There were times I laughed out loud at her inner musings. By the time I got to the ending, which was perfection, I was sad that the book was over. Now that I know this is part of a series I'm going to have to go and find the others! The characters are wonderfully developed, from the main character to the most supporting character. Tess, our protagonist, is a an independent woman that has to come to terms with allowing others to do things for her. She is used to holding her own as a detective and is suddenly having to depend on others to do the legwork for her, which maddens her. I loved her tenacity, and even though she has worries about her boyfriend Crow she is always looking at things from a logical point of view. Tess is a woman's woman if I do say so myself! This is the first time I've ever read one of Laura Lippman's books, despite her NYT Bestsellers fame. I'm glad that this book was offered to me and put this fantastic series on my radar! 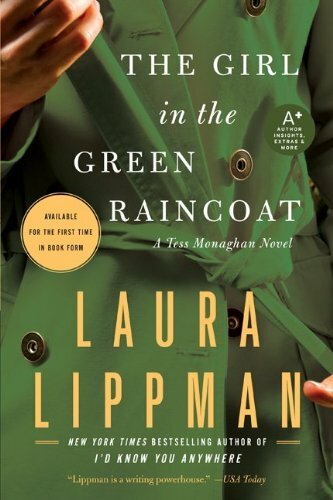 Overall, The Girl in the Green Raincoat is a superbly written novel with witty dialogue, well written characters, and a thrilling plot that doesn't disappoint. All you mystery fans out there need to go pick up a copy as soon as possible!